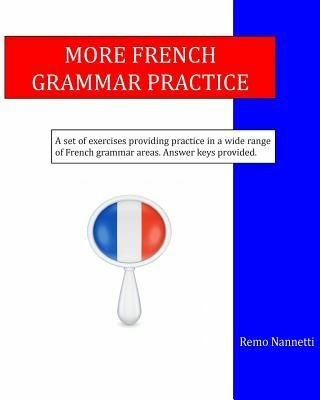 More French Grammar Practice is a collection of 45 worksheets and is the companion volume to French Grammar Practice (also published by CreateSpace). It covers those grammar points not included in French Grammar Practice but can be used independently of it. The book assumes that you have already learned the particular grammar point you intend to practise and for this reason no explanations of the various grammar points are provided. It is therefore recommended that you have to hand the particular French grammar or course book that you have been using for reference purposes. Answer keys are provided for all the exercises and are situated at the back of the book. The following grammar points are covered: Numbers, Weather Expressions, Telling the Time, Temporal Expressions, Means of Transport, Shapes & Colours, Geographical Names, Nationalities & Languages, Avoir Expressions, Frequency Expressions, Adverbs, Superlatives, Conditional Tense, Pluperfect Tense, Future Perfect Tense, Conditional Perfect Tense, Past Historic Tense, Si Clauses, Present Subjunctive Tense, Imperfect Subjunctive Tense, Perfect Subjunctive Tense, Pluperfect Subjunctive Tense, Passive Voice, Impersonal Verbs, Infinitives: Special Uses, Devoir, Pouvoir, Savoir, Vouloir: Special Uses, Aller, Avoir, Etre, Faire: Special Uses, Faire: Causative Constructions, Present Participles & Gerunds, Y & En, Pronoun Sequences, Disjunctive Pronouns, Relative Pronouns, Indefinite Pronouns, Pronouns & Infinitives, Prepositions: Special Uses, Prefixes, Suffixes. If you are a teacher or lecturer then you may be interested to know that A4 photocopy master versions of French Grammar Practice and More French Grammar Practice are available on my website www.frenchgrammar.co.uk. E-reader versions can also be purchased online for all popular platforms. If you are learning or teaching Italian then two further titles, Italian Grammar Practice and More Italian Grammar Practice have also been published by CreateSpace. For A4 photocopy master versions of these titles please visit my website www.italiangrammar.com. E-reader versions can also be purchased online for all popular platforms. Another title, Italian Homework Activities is also available for sale on www.italiangrammar.com as a photocopy master pack but is not currently published by CreateSpace or as an E-book.